← LittleeLit at ALA Annual in Vegas! In 2010, when I worked as a Reading and Comprehension Consultant, and the year the iPad launched, I immediately got excited at the potential for iPad usage in education. Of course now it’s become a mainstay in the classroom. When I started working in libraries in 2012, my gears started to crank again with potential ideas for program use. Last summer I got to partner with a few of our children’s librarians to test out some apps in teen programming and storytime and discuss how to use iPads and apps in the most effective ways. It was well received but progressed a bit slower than I’d hoped (as some of you may have seen at your libraries). Getting people on board and excited can be a task in and of itself, in addition to just figuring out how to make it work. But once you get the ball rolling, it can be contagious and hard to stop. So earlier this year, I started brainstorming with Amy Wright, Rifle’s Children’s Librarian, about how we could use iPads with the kids. Amy started to implement the digital piece in her core storytime while we planned to launch an all digital specialty program called Digi-tots Playtime. We’ve been through 2 Digi-tots sessions now, held the First Tuesday of each month, and so far we feel we have a solid program. The challenge is getting people who would want this program to come on a different day that is outside of anything they else they attend regularly at the library. The feedback from those who attended has been great. It’s amazing to see how much families know and do not know about mobile devices and apps. 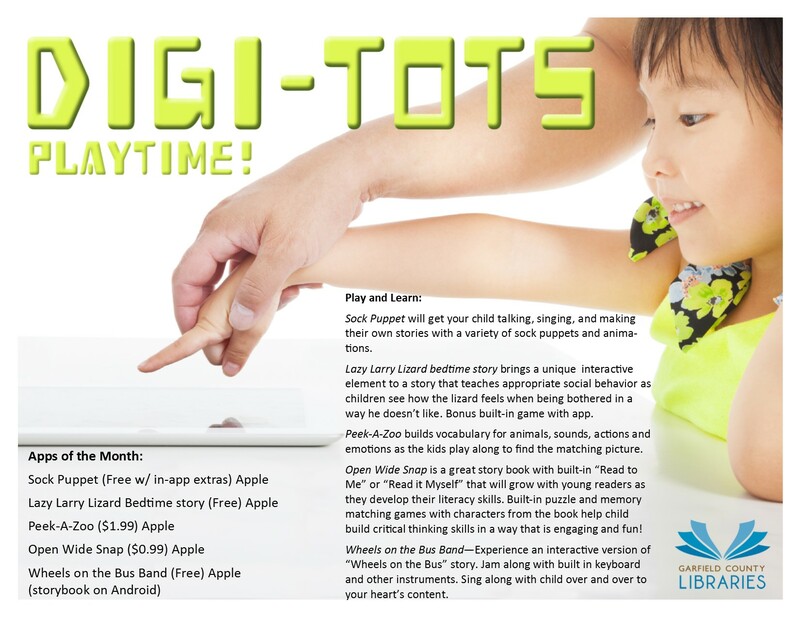 About the program: we have structured Digi-tots Playtime similar to storytime since it is something the kids are already familiar with. We have an opening song, a story app, an APP-tivity, a second story and one final APP-tivity before free play. The goal is to let the children with their caregivers have the iPads in hand so that they can explore the app along with the group. This had mixed results the first time we did it, especially with stories. Once the kids figured out how to turn the page, some of them were 2-3 pages ahead of the group and no longer attached to the group activity. This brought to awareness that we need a “best practice” for when the iPads are in their hands. Basically, some fun rules that engage the caregiver to encourage the child to keep “hands up” when Miss Amy is reading, and to touch the app when she says it’s okay. We haven’t had a chance to implement this thinking yet, but we shall see for next time. 1. Endless Alphabet – Having the kids talk and tell the answer to what letter comes next in the jumbled word, and to play and make silly faces and the sounds of the letter. When we did the word “exercise,” we also played by exercising at the end of the word. 2. colAR Mix – Letting the kids write and color on the page and watch their faces light up as their creation came to life on the little screen (ie. iPad Mini). This app is a great introduction for families to STEM-based learning. 3. Wheels on the Bus Band – We played the song on the big screen and sang, and the kids had access to the iPad and app and can use any of the numerous built-in instruments to play and jam along. One thing to note: because that app interface is very busy, the children could feel overwhelmed by all the colors and activities. We talked about maybe having other singular instrument apps loaded, like the bongo apps, and also having things like egg shakers and other real instruments available in case the child wants to use something else. At the end, the kids are free to go play with toys or play on the iPads with any of the apps we have loaded. We make ourselves available to answer questions that caregivers might have and to engage the children in play. The whole thing, with freetime at the end, goes for about 45 minutes, which is a good amount of time for this type of program. We are excited for next month and will be working on bringing new families in to try it out and hopefully help them better navigate this digital world they are in. Posted on April 11, 2014, in Apps, Interactivity, iPad and tagged Stephen Tafoya. Bookmark the permalink. Leave a comment.